This is my first attempt at the famous "Pavlova." After a few disasters making Merangue, I thought I'd never be able to make this "egg-white wonder." However, I thought I'd have a go as we have a lot of raspberries growing in our little garden. It turned out far better than I expected. It had crunch outside and marshmallow texture inside. I'm so happy about the result. The only issue was the colour. It was as white as snow before I put it in the oven, but it came out slightly brown. So I asked my baking friends what I should have done to make it a "VERY white" Pavlova. So, here is the list to check. Set the oven temperature VERY low. Think of "drying" rather than "baking". Turn the temperature down immediately after when the pavlova goes in the oven. Use a "conventional oven" rather than a "fan oven". 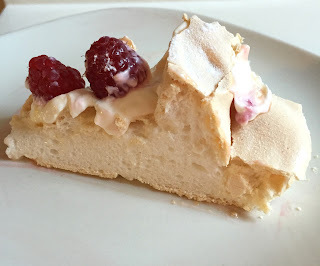 Make pavlova in the evening and leave it to cool in the oven overnight. Keep the oven door shut when it's cooling if you want to have a "marshmallow" texture inside. Don't worry if it goes a bit beige, it's natural. "The nationality of its creator has been a source of argument between the two nations, Australia and New Zealand, for many years, but formal research indicates New Zealand as the source," according to Wikipedia. Unfortunately, my oven is fan and does not have a "conventional" option. So, I'll adjust the temperature lower. It's a good idea to make pavlova a day before serving. Great news for a stress free dinner party. So, here is the updated recipe. Preheat the oven to 140°C (fan). Line a baking sheet with non-stick baking parchment, cutting it to fit. Using a cake tin or plate as a template, draw a 23cm diameter circle on the parchment with a pencil. Place the cornflour, vinegar and vanilla extract in a small bowl and blend with a teaspoon until smooth. Separate the eggs one at a time, taking care not to include any yolks with the whites. As each egg is separated, tip the white into the large mixing bowl. Whisk the egg whites until they are stiff enough to hold their shape. Whisk in the sugar a tablespoonful at a time, adding a little of the cornflour mixture each time. When all the sugar and cornflour has been added, the consistency of the mixture will be thick and marshmallowy. Using the spatula, turn the meringue mixture onto the baking sheet. Spread it to the marked line, then swirl with the spatula, making a slight indentation in the centre for the filling. Reduce the temperature of the oven to 120°C (fan) and bake for 1 hour, then turn the oven off and leave the pavlova base to cool completely in the oven. Spread some lemon curd, apricot jam or home-made summer fruit coolee over the indent in the pavlova. Then top up with the creme fraiche and decorate with the summer fruit.